Note: Double iron arches outside & inside. M.A. Bradley et.al., Cleveland, OH. 30 + 50 x 48 750hp at 75rpm engine by Globe Iron Works, Cleveland, OH. (1887) 12' x 12' scotch boilers at 115 pounds steam by Globe Iron Works (1887). Pine River, Saint Clair, MI. 1915, Mar 24 Documents surrendered at Cleveland, OH. 1963 Wreck removed. 1887, May 24 Enrolled Cleveland, OH; for ore & grain trade. 1887, Oct 23 Aground Sturgeon Bay, Lake Michigan. 1887, Nov Broke wheel at Sault Ste. Marie with coal. 1888 Towed barges MICHIGAN & H.A.KENT. 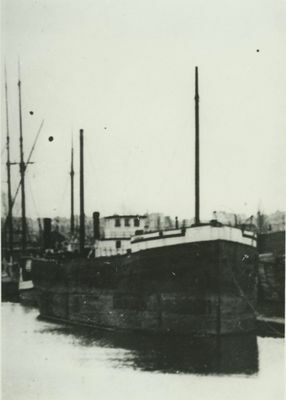 1889 Towed barges THOMAS QUAYLE & FAYETTE BROWN. 1890 Deck damaged by tower on Blackwell canal. 1891 Ran Duluth, MN - Lake Erie with coal. 1892 Towed A.COBB & NEGAWANEE. 1893, Apr 6 Owned Ohio Transportation Company of North Dover, OH., M.A. Bradley, president. 1898 Towed JOHN MARTIN, SANDUSKY & D.F.RHODES. 1898, May 4 2 Decks, 2 masts, 2213 gross tons; 1803 net tons. 1902, Jul 16 Collision with revenue cutter MICHIGAN at Erie. 1905, Sep Aground & sunk at the cut near Steere's Island, coal laden. 1906, May 6 Rebuilt as schooner barge, 1 deck, 2 masts; engine removed; 281.4 x 40.6 x 23.8' 2147 gross tons; 1986 net tons. 1906, Oct 27 Burned just inside breakwater at Cleveland, OH.